Lately, I have noticed a trend in family dining. The mom and dad talk with the adults or each other, the kids sit at the far end of the table and watch something on an iPad to keep quiet. I get why this would sometimes be tempting, especially if you’re meeting up with other adults you do not often see, or you need a few quiet minutes with your honey, but it worries me that many kids are being removed from family dialogue. In my family, we ate dinner together at the table every night. When we went to restaurants as a family, it was a special treat and everyone was involved in the conversation. The few times I sat too far away from everyone else, I felt sad. I still have a memory of one huge family dinner, where I was the odd little girl out, staring at the piñatas, disconnected and sulking. To this day, even in my childless family of two, we sit at the table and talk. The couch is not for food, it’s for zoning out. On the rare night where we don’t make it to the table together because of conflicting schedules, everything feels off. We didn’t have our time to catch up and tell our daily stories, our thirty minutes together to slow down time and not focus on anything else. Even in my much bigger family, we gather around the table together every Sunday night, a reincarnation of my dad’s family’s Thursday night dinners from another era. The participants may vary from week to week, depending on who is in town and what is going on, but it happens, without fail, every Sunday night, and Alex and I are always sure to be there. I do not claim that family dinners are the secret to being the perfect family. No such family exists. Likewise, I am sure I will also keep an iPad in my purse someday, just in case I need a few minutes of quiet. However, I contend that family dinners are worth the sacrifice of figuring out a way to get everyone together, children and adults alike. What does family dinner look like for you? Does it happen all the time? Sometimes? Never? I won’t pretend to know what other people need, I just have a soft spot for family and tradition. This post was inspired by a cool info graphic over at Full on Fit. Did you know that teenagers who eat dinner with their families regularly are much more emotionally healthy? Makes sense to me! When I was a kid, we sat down as a family for dinner every night at 6:00. Like clockwork. When the kids grew up and left home, for a number of years after that, we gathered for dinner at my parents every Sunday night. At some point, some issues arose between a couple of family members, and, oh, things just happened, and we stopped having those weekly dinners. When my kids were born, one of the things I insisted on was the same thing. Family dinner every night without the TV on. For a long time, it worked. At least when I was home. This is a perfect example of the conflict I have with my other half — whenever I’m not home for dinner, they sit on the sofa and watch TV. Kind of makes a mockery of the thing I’m trying to instill in my kids. I insist when we sit for dinner as a family that we put our phones away. When we go out for dinner, just the four of us, or with friends, same thing — no phones. We will engage in conversation with each other and the company we’re with. I had a conversation with my oldest last night on the way home from one such dinner. We were talking about what motivates me, because unlike him and many men, I don’t care about cars and guns and a lot of the “male” things” I’m supposed to care about. So he asked me “what motivates you?” I laughed and pondered how I could answer that question without revealing too much of the inner dilemma I face these days. I think my answer was something along the lines of … peace and quiet, good conversation and quality time with close friends, where we can sit and talk about anything and everything. Things don’t motivate me. That was the extent of my answer last night, but there’s more to it. People motivate me. Their emotions, their feelings, their thoughts … a dialogue that can span the realm of politics, religion, philosophy, current events, everything and all of it. That’s what motivates me. That’s why family dinners, uninterrupted by technology … enjoying the opportunity to spend some quality time with the people who are right there in front of you, instead of believing the people and the world “out there” are more important. There are three people in my life who should be more important to me than anybody else. Technology, as well as the natural progression of relationships, is driving us apart in a way I don’t like. When we’re with each other, we’re actually no longer with each other. I, too, look at families where the kids are poking away at their phone or IPad while the adults are talking and shake my head. You know why people do it that way? Because it’s easier and that’s what scares me about where we’re headed … if it’s easier, do it. Don’t make the effort to do the thing that is harder, no matter the value (not measured in things, but in your soul) you might get from taking the harder route. Sorry, for the long response … struck a nerve on this one. Don’t apologize for long comments! What you shared is really interesting, such a good window into why traditions like these disappear. It can be too hard sometimes. I just remember being a child and being expected to sit and be part of adult conversation. I learned to be patient and quiet enough to sit with everyone. Maybe that’s harder in the early years, but I feel like every kid reaches a point where that should be expected of him/her instead of going off and disappearing into something else, (phone, iPad, etc). But, you’re right– it’s hard to be the one to insist that everyone be present and focused on each other. I hope to be strong enough to do it consistently when I have kids someday. It is an interesting aspect of life that what comes easiest isn’t always best. I relate to what you want in life– connections with people, something not material. I have a book you might like, when I finish it, I’ll email you about it. Family dinner is just dinner here. We always eat together, every night, and we all stay at the table until everyone is done. Family dinner turns in to family dinner clean up after. Everyone has a job to do until the kitchen and dining room are clean. I love it. 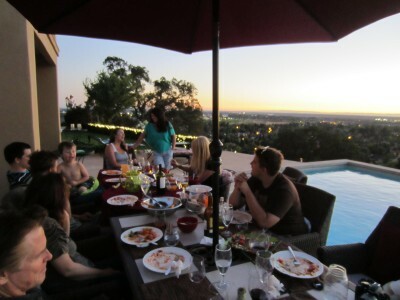 I didn’t grow up eating with my family or even at a table, but I really value that time we have together. As far as electronic devices go, I’m a stickler. My kids have portable game systems, we have a tablet and our phones are tiny computers… but they don’t use them unless it wont interfere with human interaction. If people are over, they go away. If they take them out of the house, they leave them in the car when we get where we are going. It makes me sad to see children (and adults!) with their faces in their devices, missing the opportunities to connect around them. I agree, Olivia. We eat dinner together every night. We even say grace holding hands. This is often my favorite time of the day. I will keep up the tradition. Thank you for reminding me. I’m happy to hear it is a tradition for you, too. I like the grace while holding hands, so important to remember to slow down and acknowledge all the work that went into bringing the food to the table! Growing up, my family ate together all the time. No TV in the kitchen (eat-in kitchen), only rarely did any of us kids get permission to do something like watch TV while eating. I find it disturbing that one of my daughter’s friends found it strange that we eat together all the time, but it’s important, and it makes for a healthy family. Glad to hear I’m not alone in my conviction for family dinner 😉 It is unsettling to realize how many people don’t ever eat together– that friend of your daughter is missing out! I am a big believer in family meals. Plus, studies have shown that adolescents who eat meals with their families most nights of the weeks have fewer behavior issues. It’s the family’s time to catch up with each other. So important.